Jaipur: It was all about sensations. It was about the exuberance of sounds, emotions, noise, feelings, aromas, color, joy and an irrepressible vivacity. There seemed to be thousands of people around; people who’d come from Bombay to Kolkatta to Pune to Goa to the US and London, all of them just readers and fans of literature. The sounds of laughter and loud, excited conversations drowning out the beeper-machine at the entrance. I walked inside, under a canopy of colorful, Rajastani-style umbrellas hanging from the sky, and into the big lawn where it all was going to happen. M. Hanif featured on artist Rohit Chawla’s installation ‘Out of the Box’. Image copyright: Kiran Nazish. There was no other place to be that morning. 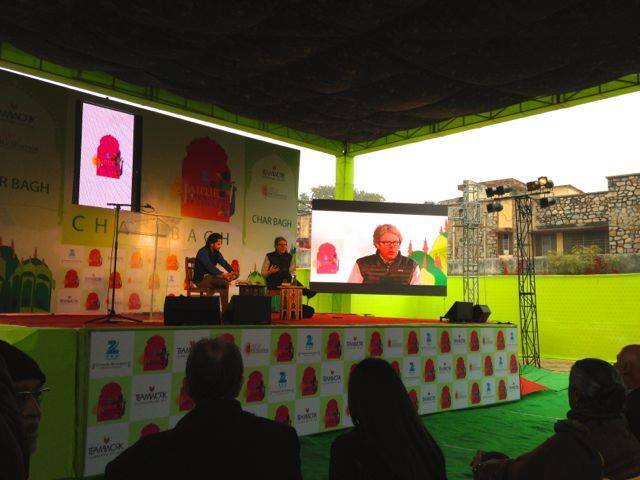 This was the biggest literature festival in the world and it looked like it. 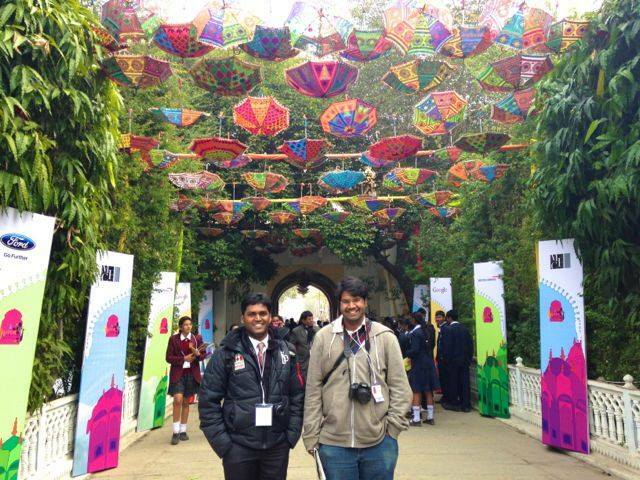 Built on a smaller festival that had started indigenously in the ‘pink city’ of Jaipur, the restyled Jaipur Literature Festival was launched by author William Dalrymple in 2006 as the first free literature festival in the world; also perhaps one of the most celebrated, judging by the increasing numbers of attendees. This year the festival broke records by bringing in 220,000 listeners across five days. No wonder he’s so happy. 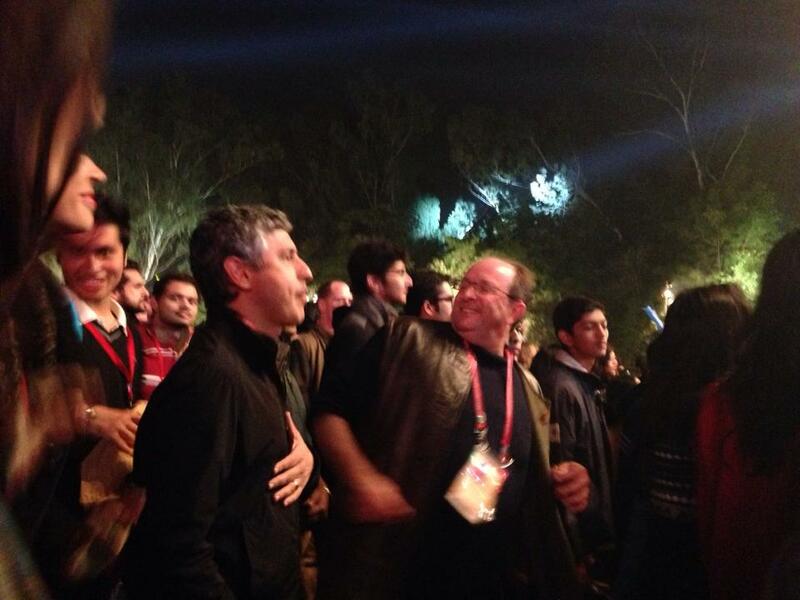 Dalrymple swinging it while Reza Aslan looks on at a musical performance. Copyright: Kiran Nazish. 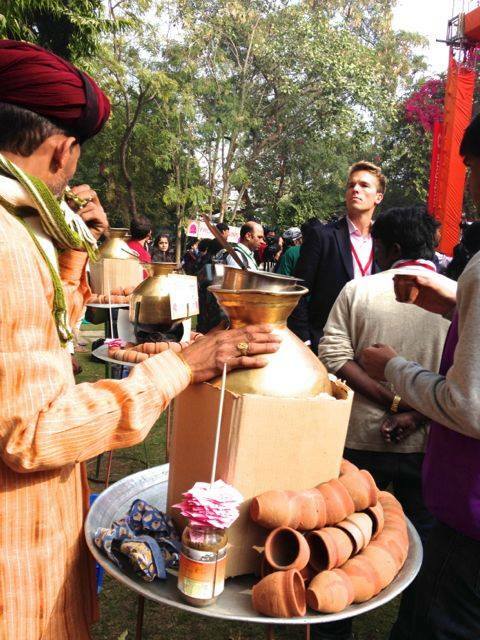 The smell of hot adrak (ginger) chai wafted soothingly through the fresh winter air of Jaipur, in the front lawn. Crowds of people were seated on chairs and on the ground, standing, some on heels, peeking over each others’ heads to catch a glimpse of the tremendous Nobel Prize winner and economist Amartya Sen, who gave the key note address at the festival opening. Sen’s keynote address outlined a seven-point vision for a better India, one that included a strong and secular right-wing party and that reserved more space for the arts and humanities in public life. Adrak chai walas. Image copyright: Kiran Nazish. The hundreds of thousands of attendees listened to about 260 panelists spread across 175 sessions. Luminaries like novelist Jhumpa Lahiri, celebrity novelist and film maker Xiaolu Guo, philosopher Michael Sandel and classicist Mary Beard engaged hundreds in every hall simultaneously. 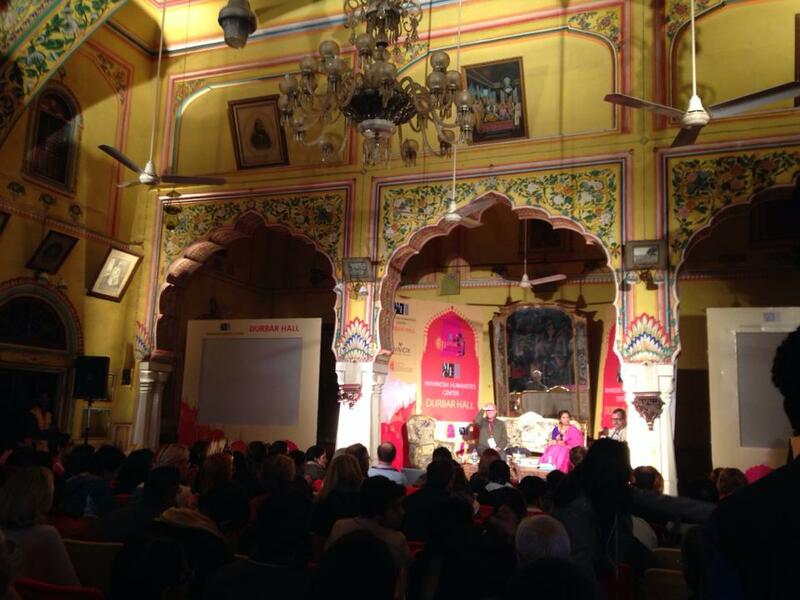 The programs at the festival were diverse, with leitmotifs of discussions on a variety of different topics, from the US troop withdrawal in Afghanistan to CIA’s war on terror, from female voices and women’s rights to India’s disappearing languages. The intriguingly-titled session “Who will rule the world?” had Professor Rana Mitter of the University of Oxford laying out China’s incontrovertible candidacy for superpower status. Sessions like “Democracy Dialogues” that included the author of “Why India Votes,” discussed India’s current challenges and new developments as a democracy. The stunning Durbar Hall, full to capacity. Image copyright: Kiran Nazish. 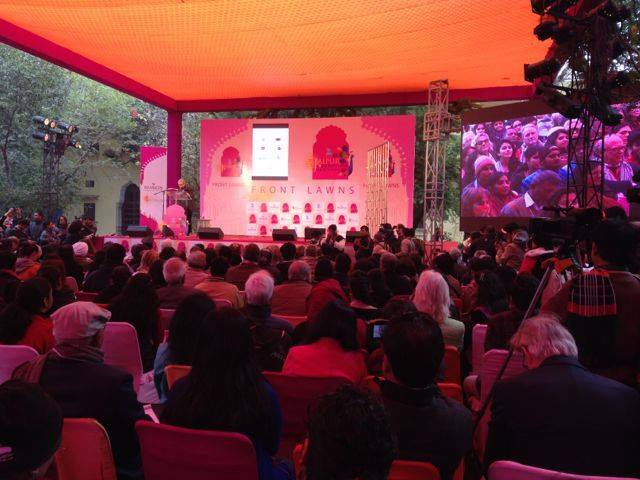 This was the Jaipur Literature Festival’s biggest and most successful year to date, leaving participants with high expectations for next year’s event. Kiran Nazish is a Pakistani journalist and academic, who currently teaches journalism at a university in India. Onwards with our exclusive coverage of the IV Goa Arts and Literary Festival! 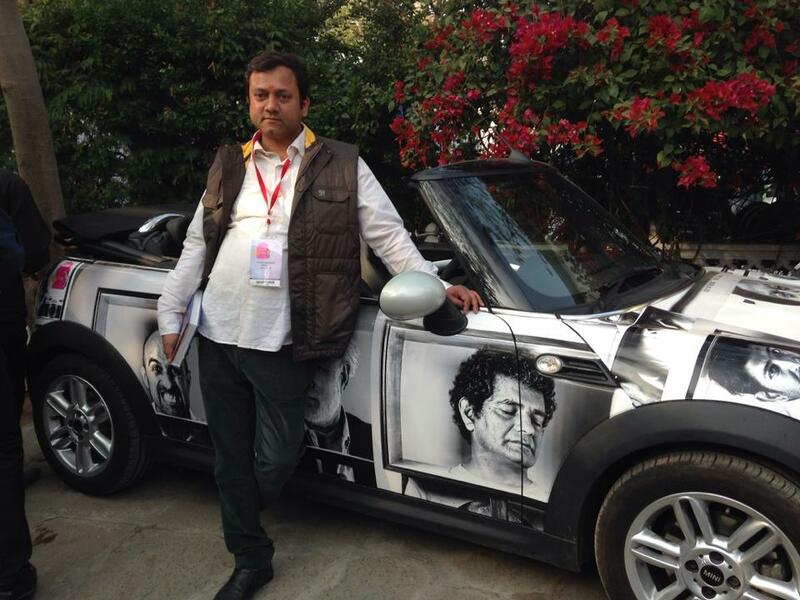 Tanweer who was launching his debut novel The Scatter Here is Too Great at GALF 2013. Bilal is a writer, teacher and translator. He holds an MFA in Writing (Fiction) from Columbia University, and is the founder of the fantastic LUMS Young Writers Workshop and Short Story Contest, now entering its third year. 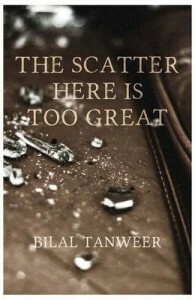 The Scatter Here is Too Great was published by Random House India in November 2013. Farheen Zehra (FZ) Tell us a little about the book and the title. Why “The Scatter Here is Too Great”? 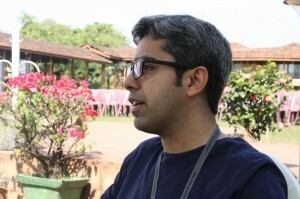 Bilal Tanweer (BT) Among the various themes of the novel, one of the themes is our need to tell stories. My book is composed of short inter-related stories, through which I have tried to make sense of Karachi’s reality. Life in this city is overwhelming and I think we use stories to make sense of our own stories, which is a major theme of the book. (FZ) The blurb on your book says, ‘This is a love story to Karachi’. Is it really, and if so, why? (BT) We travel to many cities but there is always one city inside us that we care about the most, which becomes a primary reference point for us to make sense of the world. For me that city is Karachi. It is the city I care about the most. But it is also a madly, ruinously complex city and one may never find a story that does complete justice to it. (FZ) Have you focused on any particular area of Karachi or written about it as a whole? (BT) Karachi is such a huge city that it is impossible to think of the complete picture. My narratives are as limited as they can possibly get. Each story is from the point of view of a particular character. The first story is from the P.O.V of a child from a middle class family. Then there is one sketch of a boy from Nazimabad. The book depicts stories of everyday people living in the chaos that is Karachi and I hope readers from Karachi might be able to relate to the stories. (FZ) So who is your intended audience? (BT) I think the whole question of ‘audience’ is very muddled. As a writer, I’m not focused on the audience. The reality of publishing is that the people who are paying you to write are abroad. In my case, all my intellectual training is in English but that doesn’t mean I was thinking of a reader in New York while writing the book, because that reader can never understand Karachi the same way. As far as I’m concerned, I am the first and foremost audience of my work. (FZ) Why launch the book at GALF? (BT) The organizers invited me to launch my book here. It’s a great festival with brilliant conversations on the margin so I think it was a very appropriate setting for my book launch. Also, I love Goa. It makes me think of Karachi of yore, which comes as no surprise as both the cities share strong connections and similarities. The Scatter Here is Too Great is the DWL Karachi Readers’ Club’s first read for 2014.